With the tagline “Design Tribes,” Design Week Philippines promises a nine-day borderless creative festivity with its powerhouse team of 41 partners, 32 events in 16 venues all over the metro this April 2018. 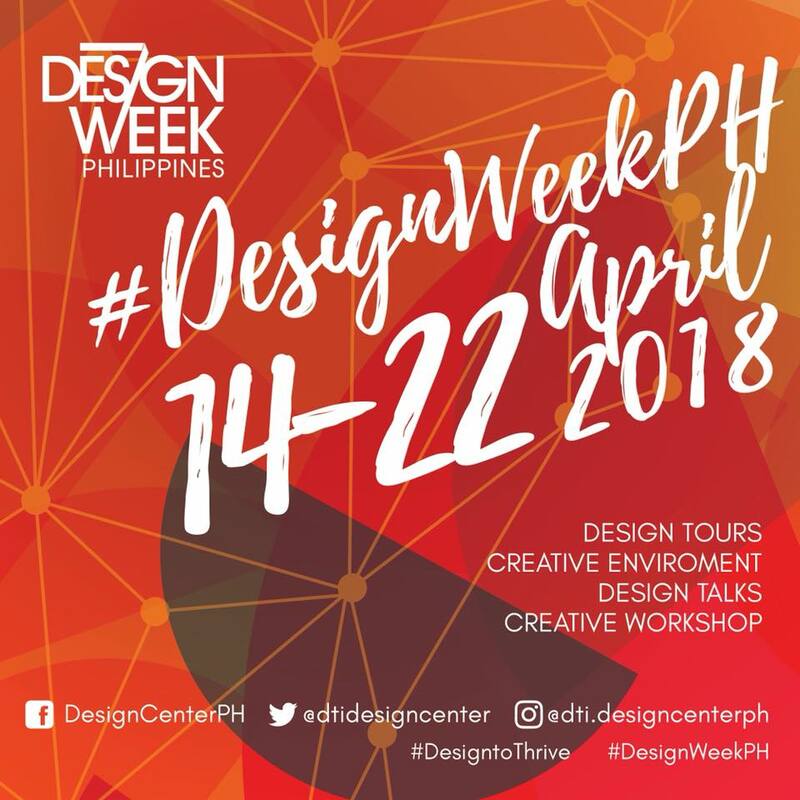 Slated on 14-22 April 2018, Design Week Philippines offers a series of design talks, design tours, hands-on workshops, exhibitions, art booths, live performances, outdoor film showing, weekend market and a lot more to make sure you get your dose of design, creativity, and good vibes. The line-up of activities is geared towards gathering creative tribes and aficionados, and engaging them to spark greater creativity and innovation. Beyond the spirit of creativity of the celebration, Design Week aims to establish connection and invigorate deeper partnerships among the country’s design and creative communities to support this initiative. Matute added that partnerships help amplify and promote new destinations and hubs that can play significant roles in enabling communities, especially the youth. “We are looking at the youth, the millennials and the Gen Z, as the next generation of minds that will create positive and progressive disruptions in society. What they do, can do, and will do will definitely shape and influence lifestyles, products, services, and industries in the coming years. What Design Week and the Department of Trade and Industry, through its Design Center, can do for them is to highlight new engagement platforms, nurture a network of creative professionals, and host events where they can gather, learn from one another, and build on each other’s ideas,” Matute shares. Several editions back, Design Week Philippines launched the historical Walled City as a creative environment, and has since supported Intramuros Administration in its initiatives at reviving Intramuros. Design Week also continuously taps the district as a home for its event components such as Design Talks, Design Tours and Creative Workshops to revitalize the historical and cultural assets of the environment and inject it with creative endeavors to encourage development of new ideas. Meanwhile, the Design Center will offer workshops on air dry dough making and wire art making on 14 April 2018. These are perfect for those who want to dip their hands in contemporary crafting and make use of the opportunity to be creative entrepreneurs for the summer. A partnership with the Film Development Council of the Philippines brings local films closer to Design Week Philippine participants through an outdoor night film showing on 14 April from 6:00-10:00 PM. Films to be shown are Loy Arcenas’ Ang Larawan, the Musical, an adaptation of Nick Joaquin’s Portrait of the Artist as Filipino, and Avid Liongoren’s Saving Sally. This edition’s Design Tours spotlight history and iconic landmarks with the iMake History Fortress Architecture exhibit in Fort Santiago, and the Destileria Limtuaco beside the LPU Gymnasium as its destination stops. The iMake History exhibit features scale models of iconic landmarks within the walls of Intramuros made with Legos. Formerly accessible only to the Limtuaco family’s friends and guests, Destileria Limtuaco, the oldest distillery in the Philippines, opens it museum to the public. Drop by these stops during Design Week to re-learn history from a different perspective. For those who want honest conversations on creative journeys, this edition’s Design Talks is for you! With the theme “Design to Thrive,” a morning session of lightning talks, panel discussions and Q&A will tackle personal and organizational stories of failures turned into triumphs and accomplishments that are now part of a growing creative economy. Guest speakers are Jodinand Aguillon, Executive Director of Pineapple Lab; Leonora Cabili, founder of Filip+Inna; Dan Matutina, founder of Plus63 Design Co.; and Ar. Arts Serrano, founder of One Zero Design Co. The conversations aim to inspire professionals and aspirants from the sphere of business, design, art, and other industries to enhance their way of thinking towards to a positive change. Supported by a powerhouse lineup of agencies, brands, companies, and collectives, Design Week extends its creative festivity outside of Intramuros to Metro Manila’s thriving creative hubs, with partner events happening in Makati, Pasay, BGC, Pasig, Muntinlupa, and Quezon City. Design Week also partnered with 98B COLLABoratory, situated in Escolta, a neighboring district of Intramuros, for its Future Market. With its goal of putting soul and spirit into commerce, the Future Market caters to creative individuals and artists to sustain their art practice and to experimenting startups and entrepreneurs to enable them to practice and transition towards a more stable and sustainable commercial setting. Drop by the HUB: Make Lab in the reinvigorated street of Escolta from 14-22 April for great market finds! 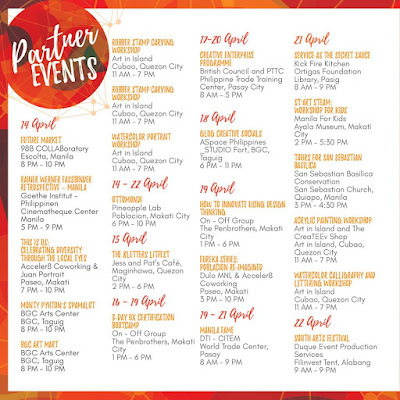 Design Center and Design Week support these partners’ initiatives and platforms in nurturing the creative capability of Filipinos, and enabling them to contribute in the building of thriving communities across various industries. For the complete list of partner events and details on Design Week, follow Design Week Philippines’ Facebook page.